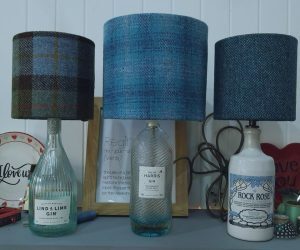 Convert a favourite bottle into a table lamp and make your own complimentary drum shade. Participants will be taught step by step how to make a drum lampshade. Everything will be provided with the exception of 0.5 m of chosen fabric and a gin or whisky bottle. Please ensure that your chosen fabric isn’t too heavy, textured or embellished. A plain or printed cotton, linen or tweed works well. Should you like to add some additional extras such as braiding or decorative pompoms please bring these along. A limited supply of fabric is available on the day at an additional cost. This is a two hour workshop and is perfect for beginners – no sewing is required. Please note that we will be using a plug in adaptor to convert the bottles into lamps. Should you require the drilled convertor as used for our custom orders please discuss with Lesley at time of booking.Classes are limited to 4 people to ensure everyone gets ample teaching time.WHEN?